number of my most memorable Nature experiences have occurred here at Sparks Lake. At daybreak the lake is incredibly peaceful and often the wildlife there really comes alive. From this viewpoint, I have witnessed a herd of deer running through ankle deep water with spray flying far over their heads, while a bald eagle sat in a tree top observing it all. I've seen great blue heron plying the water for fish while flocks of ducks and geese migrated back and forth across the lake. One morning, a pair of otters swam back and forth in front me as I stood in the water photographing. I looked up and there were two ospreys soaring overhead. Another morning as I approached the island shown in 'Merging as One', three doe deer were there, each with twin fawns! Many times when the summer sun has warmed the lake and the air temperature drops below freezing, a beautiful fog forms in the lake basin. When I created the image you see here, these conditions were perfect. I arrived very early and couldn't see the mountains through the fog. Even though I know the area well, I decided not to set up my camera yet. 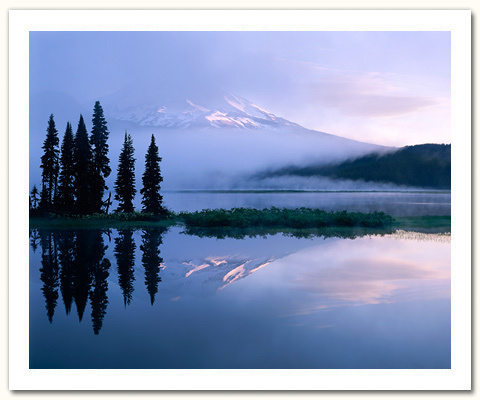 Just as the sun began to rise and strike the South Sister Mountain, the fog parted to reveal sections of the scene. The fog kept changing shape and moving across the lake. Finally, I saw 'Merging as One' materialize before my eyes. I was really taken by the 'v' shaped split in the fog on the right hand side of the frame. I chose to accentuate that element in relation to where I placed the mountain. The 'v' composition only lasted about 2 minutes...just enough time for success.